Locate a facility near you. 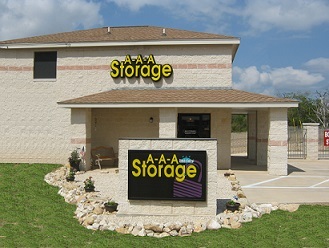 Find storage facilities in Texas. We'd love to hear feedback about your experience. Leave your facility a review here! Find the right size storage unit for your needs as well as tips on how to fill it. FREE! Claim your Self Storage Consumer's Guide Now! Delivering professional service and unmatched quality for self storage excellence every day! When you visit any of our AAA Storage facilities, you will understand immediately why we are considered the leader in the highly competitive self storage industry. We have been providing customers in several states unmatched professional service for over twenty years, ensuring that their needs come first. We focus on meeting our customers' needs by providing units of every size, matched perfectly to the amount of space your belongings require. This way you are not spending extra money on storage space that you are not utilizing. We currently build, own, and operate storage facilities in Austin TX, Pflugerville TX, Round Rock TX, Georgetown TX, Houston TX, Nolanville, TX , Manor, TX and Montgomery, TX. Regardless if you need an enclosed parking area for your boat or recreational vehicle, or you are looking to protect your belongings in a climate controlled storage unit, AAA Storage has the perfect space for you. All of our facilities are clean, secure, and can easily handle your business or personal storage needs. Let one of our AAA Storage specialists help you to determine the perfect size unit that will securely hold all your belongings so that you aren't paying for space you aren't using. Our team members will gladly offer you some unique storage tips that will ensure your valuables are safe during your stay with us. Our high quality self storage units are available for you to visit today. One of our staff members will gladly take you on a tour of the facility so you can see all the amenities available. Once you discover how a hassle-free storage experience should be, you will wonder why you haven't utilized our services before. Our entire property is professionally maintained, and each center provides customers exceptional services that will save you money. Tired of driving to the post office and waiting in line to ship packages? Let our staff package and ship that item for you right on our property. We are an authorized postal distribution center, meaning you don't have to wait in long lines any more at the local Post Office, we can take care of all your shipping needs. The facilities at AAA Storage are all monitored 24 hours a day by the highest quality security systems available. If you have any questions regarding storing your items, please do not hesitate to reach out to one of our staff members. We will gladly try to answer all your questions or concerns, and offer suggestions for saving you money when you use our professional services. If you are in need of storage space, let us show you how simple this process should be. Simply visit our AAA Storage homepage, from there you simply click the storage facility that is nearest to your business or home. Once you locate that facility, you can easily request a no obligation free quote on a storage unit, reserve a storage space, request additional information on renting a unit, or ask to speak to one of our dedicated self storage professionals. important documents, one of our team members will help you choose the appropriate size unit to accommodate your needs. If your need to store home furnishings like holiday decorations, furniture, family keepsakes, and clothing, we have several climate controlled units that will easily protect all your items. We offer ground level units that you can simply drive right up to as opposed to walking inside to your unit. If you are concerned about the safety of your possessions once they are stored at one of our facilities, rest assured knowing that at AAA Storage, we take security very serious. You will not find another self storage facility in your area that goes to such extreme measures to watch and protect all the items stored on our property. Some of the security features that we have in place are our computer-controlled gate entrance, high security locks on the units, service managers that actually live on the property, and video surveillance throughout the property in key locations. We take great pride in going that extra mile to protecting the items that we are given to secure. When it comes to the size of our self storage units, we extend to our valued customers a large variety of units that are perfect for your individual needs. Most of the units range in size from 5'x5' to 15'x50', but we also carry many units in between. The ceiling height ranges from 8’ to 12’ in many of our locations. Each AAA Storage center does provide different sized units, so call a specialist at your local center so they can tell you exactly what sizes are available. We also have a storage calculator available to our customers that can help you to get the size unit that is perfect for you. For one thing, we offer a large selection of climate controlled units designed to protect your belongings from the extreme changes in temperature outside. Our units are specifically designed to insulate your belongings from those harsh weather conditions. We also offer our customers units that have dehumidifiers, something other local storage facilities will not provide. We will never lock you into a long-term contract, you are free to stay with us on a month-by-month basis if you like, but we feel once you try us you will want to utilize our services frequently. Our facilities all have handcarts and dollies available for you to easily move your items into your storage space. We can provide you added protection of all your belongings with affordable Tenant Protection Insurance that starts at only $10 a month. If you are looking for a facility to store your possessions, let one of our AAA Storage managers assist you in finding the perfect unit today. Our storage facility managers are on hand to walk you through the process, show you the units currently available, and answer any and all questions that you may have. Give us a try today and see how our commitment to exceptional customer service is unrivaled in this industry. aaastorage.com New Website Video Tour from David Luce on Vimeo.